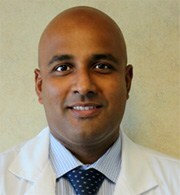 Ashwin Jathavedam, M.D. has been with Leonia Medical Associates since 2008. He completed his undergraduate studies in New York City at The Cooper Union for the Advancement for Science and Art where he graduated with honors and was elected to Tau Beta Pi, the national engineering honor society. From there he completed his medical education at the New York University School of Medicine. Dr. Jathavedam then completed internship and residency at the Robert Wood Johnson University Hospital of the University of Medicine and Dentistry of New Jersey in New Brunswick, New Jersey. He went onto specialize in the field of infectious disease by completing fellowship training at the Memorial Sloan Kettering Cancer Center in New York City. Dr. Jathavedam has an interest in the treatment of HIV and also infections in the immunocompromised host. He published several articles during his training and was awarded a grant to present his research at the 2007 Infectious Disease Society of America general meeting in Chicago. He continues to be actively involved in the education of physicians in training at the Englewood Hospital and Medical Center where he lectures for residents and medical students at conference and also supervises teaching rounds.